Why am I writing an entire post about how we got a clock? I am here to explain it all! It is something near and dear to my heart so I wanted to share. On November 14th, my Busia (grandma) passed away. She was one of the very closest people to me and her death is a huge loss to my family. We got together with Busia frequently and most of the time, we went to her house. 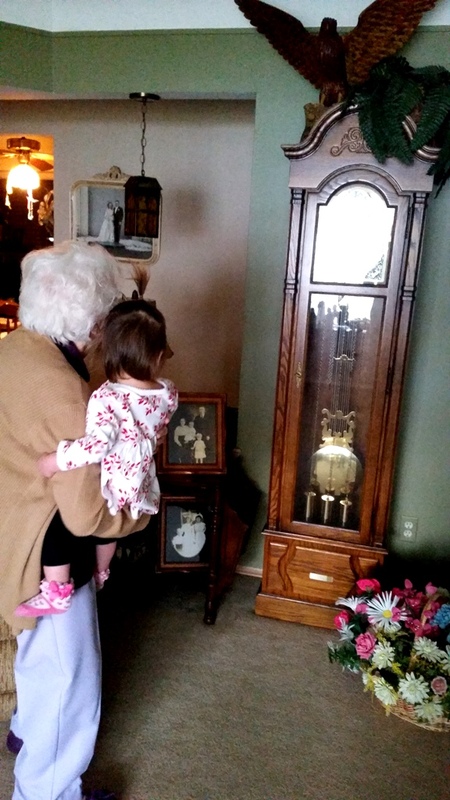 She had a huge grandfather clock in her living room and it was a super special part of her and Adalyn's relationship. From the time that Adalyn was a baby on, she loved this huge clock. After giving each other hugs, the first thing that we would do when we got to Busia's house is go to the clock. Even if it was not the right time for it to go off yet, Busia would make it go off so that Adalyn would not have to wait. She was not supposed to be lifting Adalyn because it bothered her back but she did it anyways. Busia always did what SHE wanted to do. They would stand by the clock and listen to it go off together. Clock was one of Adalyn's very first words because of this. Or more like "Ka-lock!!". This tradition started right when Adalyn was super tiny through the time when Busia passed away (Adalyn was a little over 2). This was their tradition and only one of the many special moments that they shared together each time that we visited. 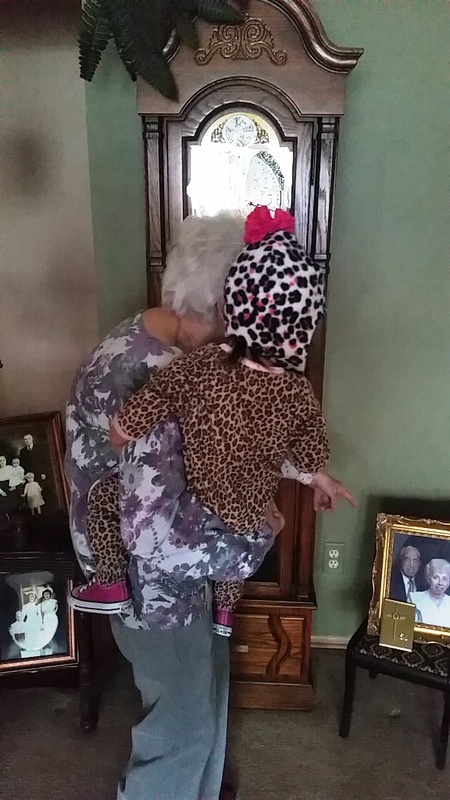 Some of their other special moments included Adalyn jumping on the bed while Busia held her hands, playing the keyboard piano together, playing with my Mom's old dolls together, etc. One of the other special things was that Busia loved giving Adalyn way too many sweets. On one of our last visits to Busia's house, Adalyn ate cookies, ice cream, cake and candy and then Busia was mad at me when I told her no more!! This is something that I will never forget. As you can probably tell, I had a special relationship with Busia but so did Adalyn at even such a young age. She constantly asks to see pictures and videos of Busia. 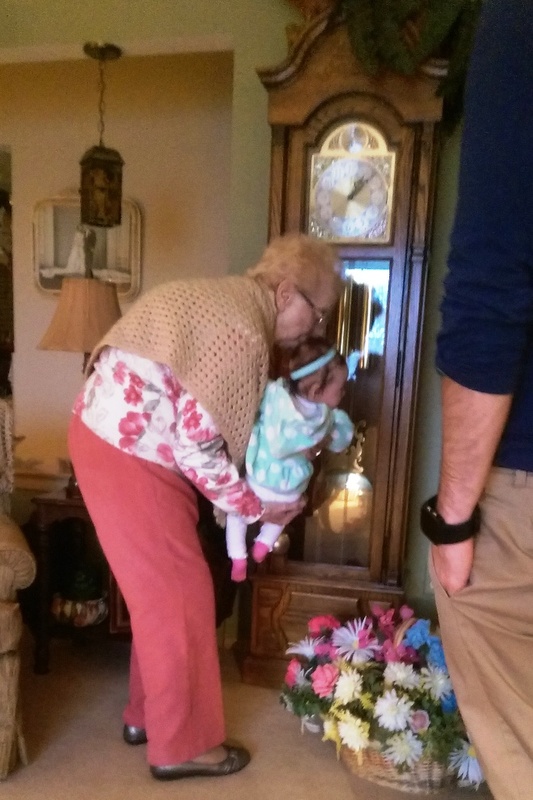 At her viewing, Adalyn spent most of the evening at the casket and if we made her go away, she immediately wanted to come back to it to look at Busia. She is able to tell me that Busia is in heaven with God and tells me that she is "so, so happy in heaven" which is just heartbreaking and adorable at the same time. After Busia passed away, it was discussed who would get what from her home. My sister is purchasing her home which is beyond special. My brother is inheriting her bedroom set. I am so touched because Troy, Adalyn and I inherited her special grandfather clock that holds so many memories in my mind forever. Adalyn constantly tells me that she is happy to have Busia's clock and looks up to heaven and says "thank you Busia for the clock"- she is wise beyond her years. That is the exact same clock my husband's relatives have and I mean exact!